The gut-wrenching memory of a giant lake trout disappearing into the darkness of Minnesota’s Lake of the Woods, while I stood helplessly staring at a failed knot at the end of my line, still haunts me every time I tie a knot. The average angler can get by with three or four knots; two or three for tying lures or hooks to terminal line, and one or two specialty knots. Among the best for tying terminal line to hooks, lures, or swivels are the improved clinch, Trilene, and Palomar. After the “incident”, I sat down and selected six knots that serve all of my angling needs. I practiced them over and over, until I could tie most of them blindfolded. It may sound obsessive, but I have not lost a fish to a broken knot since then. The improved clinch knot is one of the most commonly used knots, because it is easy to tie, reliable, and generally strong when tied correctly. The trilene knot is similar to the improved clinch, but tends to be stronger. When tied correctly it offers up to 100 percent of the line’s breaking strength. The one drawback to the Trilene is that it will not work well for small flies, because the line must be doubled back through the eye. Some anglers claim the palomar knot offers the strongest connection between line and lure. For anglers who regularly fish with braided line, it certainly is the best choice, because it is one of the few knots recommended for this type of line. The Palomar is quickly tied after considerable practice and provides up to 90 percent of the line’s breaking strength. One downside of the Palomar is that it can adversely affect the action of some lures. Other knots for connecting line to hook, include the uni knot, half blood, Orvis, and grinner. The hook snell is also used to attach line to a hook, but the line must be a leader, because both ends of the line are used in the tying process. It is simple, strong, and easy to tie. Another variety of commonly used knots connects two sections of line. Fly anglers are especially dependent upon knots such as the nail, blood, and surgeon. The nail knot is most often used to connect the leader to the fly line. It is strong, reliable, and it rolls out effectively when casting. A choice for joining lines of different diameters is the albright knot. It also is strong, but takes more precision to tie than the nail knot. Both the blood and surgeon knots are used to connect two lines of similar diameter. Each is strong, fairly easy to tie, and presents a low profile when casting. 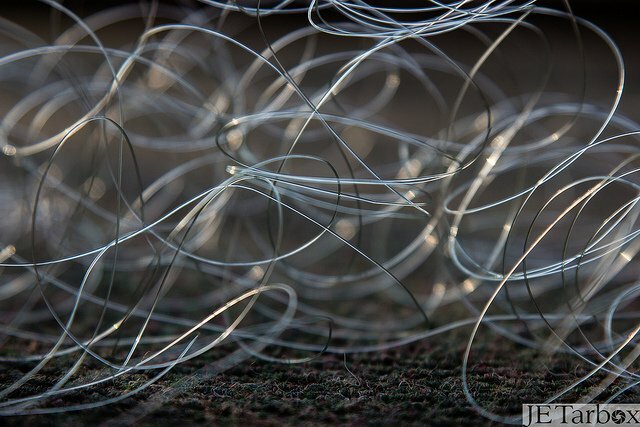 Anglers may choose to learn a few specialty knots, depending on their needs. As an example, the drop loop knot is used to form a loop that attaches sinkers to the main line. Another useful knot is the float stop, which holds a float at a specific point on the main line. Whatever the knot, anglers should follow a few simple tips that will increase the knot’s strength. The first is to lubricate the knot before drawing it tight. Wet the line with saliva or water. The lubrication decreases the heat created when the line rubs together, which prevents damage to the line. Once lubricated, the knot should be tightened slowly and evenly. Give the line a solid pull to make sure the knot holds.